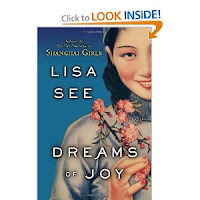 The major criticism of Lisa See's previous book Shanghai Girls was that it ended so abruptly. At long last, with See's new book Dreams of Joy, fans will finally see what wound up happening to sisters May and Pearl and their daughter Joy. Joy picks up immediately where Shanghai Girls left off, where Joy runs away after her father's suicide whereupon she learns that Pearl is actually her aunt and not her biological mother (May is the true mother). Joy flees the United States and returns to China in an effort to find her true biological father, an artist named Z.G. The only problem is that China is undergoing its massive communist program "The Great Leap Forward" and the country is very very different than what Joy is prepared for. Once in China, Joy finds her father and settles into life on the Green Dragon commune and struggles to regain control over her life and what she thought was her family. Meanwhile, Pearl rushes back into the country she fled 20 years ago to find and rescue her daughter. But with Mao and the communist regime in charge, living is significantly harder than expected. Overall, a quick read. Readers will see life through both Joy and Pearl's eyes. Despite not being her biological mother, Pearl has a fierce love and devotion for her daughter that is touching. As Joy quickly realizes the error of her decision to come to China, her growth and maturation is 100% believable.